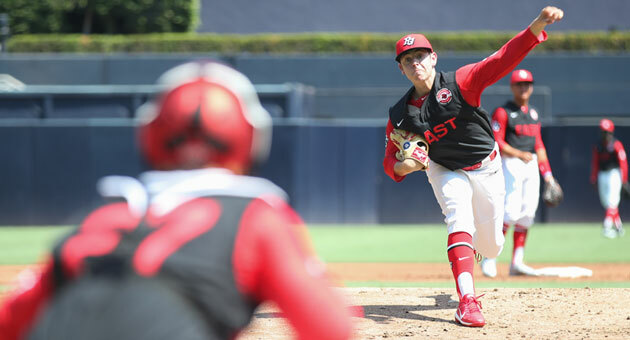 The full game recap from the 2018 Perfect Game All-American Classic is now available as the West beat the East 4-2. Corbin Carroll reached base all three times he came to the plate, walking twice, scoring two runs and hitting a booming first inning triple. One of them coaches at a prestigious high school that sits not far from the Atlantic Ocean beaches in South Florida. The other runs a program at an equally prestigious school that sits about an equadistance from the Pacific Ocean in Southern California. 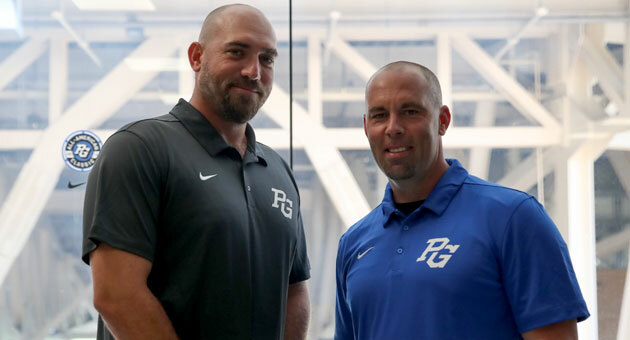 Although their schools are separated by more than 2,700 miles, Alan Kunkel and Jared Halpert were brought together this weekend at the PG All-American Classic because of their love of baseball and their love and respect for the young men who play the game at such a high level. 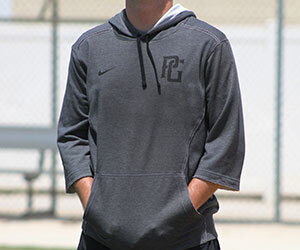 Kunkel, the head coach at Calvary Christian Academy in Fort Lauderdale, Fla., the head coach at Harvard-Westlake School in Studio City, Calif., have been in San Diego since Thursday and will guide the East and West teams, respectively, in Sunday’s PGAAC at Petco Park. Both men were speaking from the field at Petco during a Sunday morning BP session capped by the finals of the Rawlings Home Run Challenge at Petco, right before the Phillies and Padres took the field for their National League inter-divisional showdown. The Classic was to be played as the second game of the unique double-header. Kunkel guides a program at Calgary Christian that won Florida state championships in 2016 and 2018. He widely respected as one of the top high school coaches in the country who has a knack for getting the most out of his players regardless of their talent level. He has been very impressed with the young men who are the East roster this weekend. “You’re having conversations with these kids and they very much act and behave as adults,” Kunkel said. “They’re excited and they’re here having fun, and they’re excited about the opportunity to play against competition that’s very good. Halpert became an assistant coach at Harvard-Westlake in 2011 and took over as head coach of the storied program in the spring of 2016. 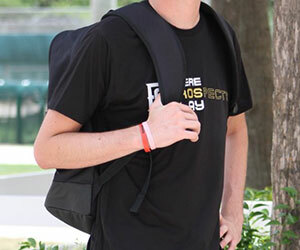 He, like Kunkel, as enjoyed interacting with the PG All-Americans, each of whom have been identified as among the best of the best from the class of 2019. The PG All-American Classic is more than just the game itself. It’s an event that is spread over four days with activities such as fund-raising for and a visit to Rady Children’s Hospital-San Diego that helps raise the awareness of these young men while also building camaraderie amongst them. Although both coaches are recognized as terrific tacticians, neither planned on doing a whole lot of coaching once the Classic gets underway. “Hopefully I’m going to be swinging my right arm a whole bunch, but other than that I’m just going to enjoy the game and try to take it in like the rest of the fans here,” he said. 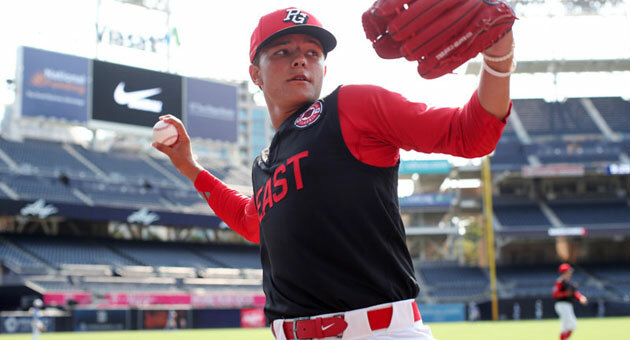 Florida slugger Rece Hinds dropped eight bombs beyond the leftfield wall at Petco Park on Sunday morning to claim the championship at Rawlings Home Run Challenge. Hinds, a 6-foot-4, 210-pound right-handed hitter who will be at IMG Academy for his senior year this fall, hit four home runs in the semifinals to sneak past fellow Floridian Hunter Barco, 4-3, and then edged another Floridian, Tyler Callihan, by the same 4-3 count in the finals. Callihan topped Washington’s Corbin Carroll, 3-2, in their semifinal pairing. Hinds led everyone with 10 home runs during the Challenge’s first round on Saturday, also held at Petco. Callihan reached the finals by going yard eight times in the first round, and Carroll and Barco each dropped six bombs on Saturday. The 52 PG All-Americans were feted at the 16th annual PG All-American Classic Awards Banquet on Saturday night, and even welcomed an honorary 53rd member to their group during ceremonies held at the Bayfront Hilton Hotel Promenade. Colleyville, Texas, standout Bobby Witt Jr., the No. 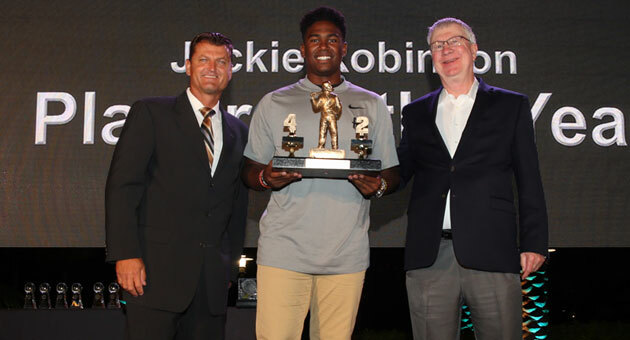 1-ranked prospect in the national class of 2019, was the recipient of the prestigious Jackie Robinson Award, an honor bestowed on the Perfect Game National Player of the Year. 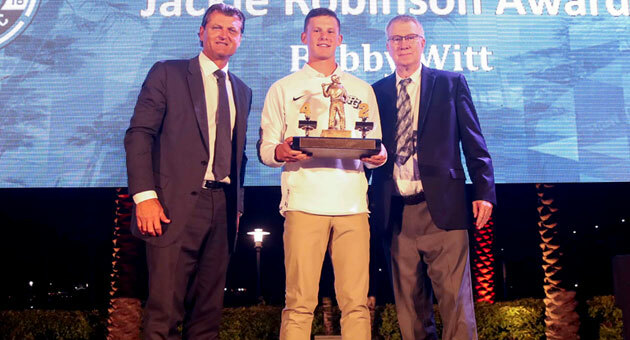 That presentation capped an evening during which eight other All-Americans received awards handed out by PG sponsors and partners, while the work of the doctors and the staff at Rady Children’s Hospital, the PGAAC’s beneficiary, was lauded and praised. The highlight of the evening came when the gathering of players, their families, sponsors and PG personnel – including the company’s entire ownership group – heard from 16-year-old Kacey Harvey, a remarkable young woman who courageously battled and beat Alveolar Rhabdomyosarcoma, a form of cancer that normally develops in skeletal muscles. Kacey was named an honorary member of the PGAAC West team. The gathering also learned that the members of the East and West team combined to raise nearly $60,000 (East $30,305, West $29,439) in funds that will be donated to the Rady Children’s Hospital Peckham Center for Cancer and Blood Disorders. West team member Logan Britt from Texas was the top fund-raiser at $8,950 while Florida’s Hunter Barco from the East team was close behind at $8,900. As a whole, it was a special evening that left everyone in attendance both touched and determined. “It’s something that I will never forget,” Witt said. “Listening to Kasey talk about her experiences, it really shows me how hard it was with the things she went through and it really shows me that whenever I think something’s wrong, it’s really not that bad. Game day is upon us. 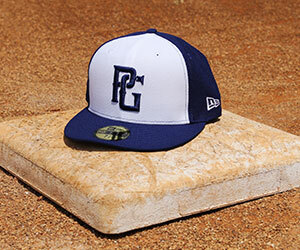 The 2018 Perfect Game All-American Classic will be played at 5:00 pm PDT at Petco Park; first pitch is scheduled for 5:18. The players will have another BP session at Petco Park followed by the final round of the Rawlings Home Run Challenge prior to the Padres/Phillies game set to be played at 12:40 p.m. PDT. The game itself will be available on MLB Network with Daron Sutton, David Rawnsley, Dan O’Dowd and Dani Wexelman providing the analysis. The game will also be available on satellite radio, as Mike Rooney and Patrick Ebert will provide the commentary on ESPNU on SiriusXM channel 84. The game will be broadcast again on radio at 8:00 p.m. PDT on Sirius 209 and XM 89 in lieu of Perfect Game's usual weekly MLB Roundtrip Sunday night segment (after Sunday Night Baseball). And if you’re unable to tune in to the game on MLB Network you can access a livestream of the game via MLB.com here. Full details are available on the PG All-American Classic Event Info page. Another first for the 2018 PG All-American Classic was Saturday's visit to San Diego's Jackie Robinson YMCA where the 52 players interacted with children as part of Major League Baseball's Play Ball initiative. Watch the video above from our friends at MLB.com to get a taste for this experience. 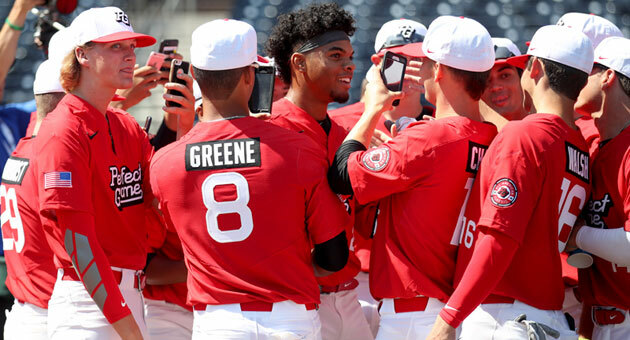 The link to watch the online stream for the 2018 Perfect Game All-American Classic on MLB.com is now available. Game time is set for 5:00 p.m. PDT with the first pitch scheduled for 5:18. Take the time to read the feature in Friday's San Diego Union-Tribune as Padres reliever Robert Stock reminisces on his time spent at the 2006 PG (then Aflac) All-American Classic when he started the game for the West and also hit a bomb off of East pitcher Rick Porcello, who is now a member of the Boston Red Sox. The players returned to Petco Park on Saturday morning taking a brisk round of BP followed by the preliminary round of the Rawlings Home Run Challenge. Prior to the challenge representatives from Rawlings presented the players with the new Quattro and Velo bats, an opportunity that always draws a lot of audible excitement. The West squad hit first, with Corbin Carroll leading the way with six home runs. He advanced to Sunday’s finals along with three members from the East: Rece Hinds, Tyler Callihan and Hunter Barco. Hinds, who entered the event as one of, if not the favorite to win the event, led all hitters by hitting 10 out. Callihan hit eight and Barco, like Carroll, hit six. Those four players will have the opportunity to swing the sticks once again at Petco on Sunday morning to walk away as the 2018 Perfect Game All-American Classic Rawlings Home Run Challenge champion. The final round of the challenge will occur prior to the Padres/Phillies game, which will precede the 16th edition of the Classic. After the players visited Rady Children’s Hospital they put on their trunks and took a dip in the Pacific Ocean as part of the annual visit to Del Mar Beach. Be sure to view the event’s Twitter handle and Flickr page as linked above for photos of this visit. New to the schedule this year is that all on-the-field baseball activities are being conducted at Petco Park, the home of the San Diego Padres. In past years only the game itself on Sunday night was played on the big league field, which raised the excitement level for the players, and their families, significantly heading into Friday. In addition, the first practice, and the annual scrimmage, were bumped up to take place before the visit to Rady Children’s Hospital. The East and West teams began the day by taking a quick round of batting practice, following by infield and outfield drills before the scrimmage got underway. Similar to last year when eventual eight-overall pick Ryan Weathers pitched in the scrimmage since he was ineligible to play in the game itself due to Tennessee high school athletic association rules, fellow lefthander Hayden Mullins of Gallatin, Tenn., started the game for the East and tossed the first two frames, holding the West squad in check. With an exaggerated leg kick similar to that of MacKenzie Gore, who participated in the Classic two years ago and was the third overall pick in the 2017 MLB Draft, Mullins threw four pitches for strikes, including his 88-92 mph fastball. The pitch was mostly in the low-90s out of the windup and in the upper-80s out of the stretch. The two distinct breaking balls gives him two distinct looks to give both righthanded and lefthanded batters, and while he only threw one changeup it was a good one, using it to pick up a strikeout in his first inning of work. The change recorded 85 mph on the radar gun with the slider sitting consistently at 80 and the curveball being thrown in the mid-70s. 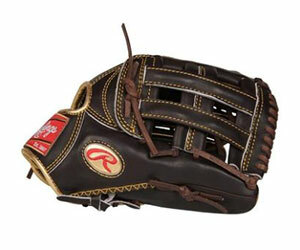 He did a nice job working the corners with all of his pitches, striking out a pair and inducing weak contact. In his two innings of work he didn’t allow a run with a pair of punchouts, two flyouts and a groundout. The rest of the pitchers to take the mound – Wyatt Loncar, Jack Hyde, Max Flame and Ricky Tibbett – are members of the San Diego Show and SGV Arsenal programs that always are kind enough to provide the Classic with a handful of fresh arms. Loncar worked the first three innings for the West team throwing in the 83-85 mph range with his fastball touching 86. Flame tossed the final two innings for the West and worked at 85-87, touching 88. Hyde sat in the 87-88 range touching 90 while Tibbett threw his fastball in the 85-88 mph range and was consistently at 87 mph. Similar to past years, there wasn’t a lot of scoring during the game. The East squad did get on the board early as Anthony Volpe hit a run-scoring double to the gap in right-center field. That hit scored Myles Austin, who led off the scrimmage with a walk. Tyler Callihan had the hardest hit ball in the scrimmage in the fourth inning, smoking a line drive back up the middle that put the East up by a score of 2-0. Callihan brought home Jud Fabian, who had reached on an error to lead off the frame, a miscue that allowed him to advance to third base. In the top of the fifth Connor Walsh ripped an RBI single to right field that drove home Jerrion, who opened the inning with a walk, and put the East up 3-0. 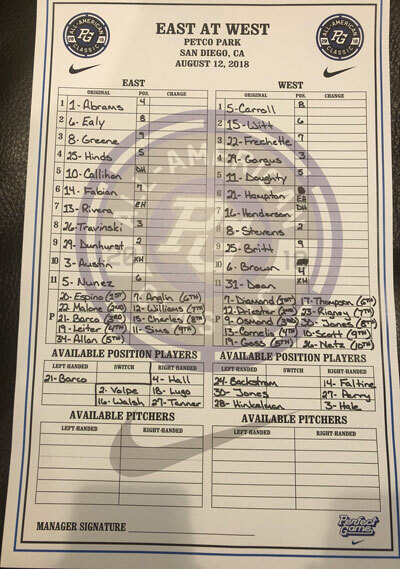 The second player from the state of Tennessee that won’t be able to participate in Sunday’s game, outfielder Maurice Hampton Jr. of Arlington, Tenn., had two plate appearances in the scrimmage serving as the leadoff hitter for the West squad. In his second trip to the plate he brought in the West’s only run on a 4-6 fielder’s choice. That run made it a 3-1 ballgame, the final score of the contest. There were two other offensive highlights of the game that didn’t factor in the scoring, or show up in the box score. After Nasim Nunez hit the first pitch he saw up the middle to open the third inning, he alertly turned on the jets when he noticed the defenders up the middle were a little slow getting to the ball. However, once he reached he was picked off trying to be too aggressive on the basepaths. CJ Abrams ran an impressive 4.02-second home-to-first time and made a routine 1-3 groundout a lot closer than it should have been in the fifth inning. The play allowed Ealy to advance to second. The players will return to Petco Park on Saturday morning for their second practice of the event as well as the first round of the home run challenge. 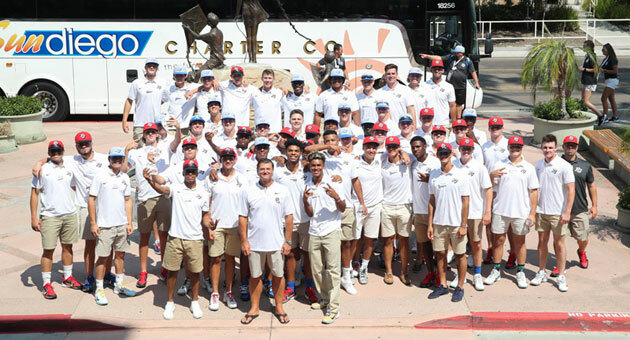 The 2018 Perfect Game All-Americans were officially embraced in San Diego Thursday evening at the Welcome Reception Dinner/Pool Party held in a delightful outdoors setting at the beautiful Marriott Mission Valley Hotel. The 52 All-Americans and their families, along with this year’s two coaching staffs and PG staff members, were treated to an excellent dinner and heard from many different speakers, including PG Founder and President, Jerry Ford. “We really truly are looking for players that we think have a very good likelihood of playing in the major leagues someday, whether that be soon or later after playing in college,” Ford told the gathering, explaining how the players were chosen. “So, everyone here, in our estimation, has a good chance to play in the big leagues someday. 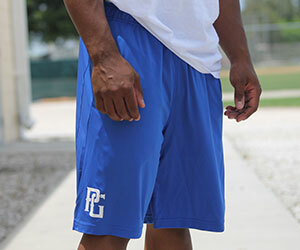 This is the 16th annual PG All-American Classic and for the first time every player on both the East and West rosters was a participant at the PG National Showcase, held this past June at Tropicana Field in St. Petersburg, Fla.
At the end of his brief address to the players, Ford reminded the young prospects of what fundamentally, at its roots, the PG All-American Classic is really all about, and that is its stated purpose of raising funds to benefit the Rady Children’s Hospital-San Diego in its fight to finally thwart pediatric cancer once and for all. The All-Americans will make their scheduled visit to Rady Children’s on Friday. The 52 2018 PG All-Americans arrived in San Diego on Thursday and the event officially kicked off with a welcome dinner that was followed by a pool party. 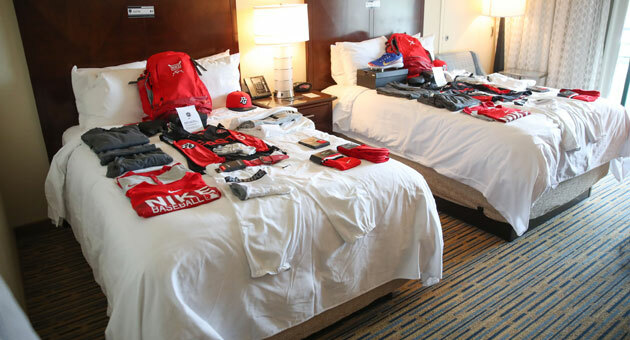 Prior to dinner the players had the opportunity to check into their rooms where they were welcomed by an eye-popping assortment of Nike gear on their beds, including their practice uniforms, warmup gear, batting gloves and cleats. They then had the opportunity to visit the player lounge where members of the Nike staff were on hand to personalize their shoes. Friday morning the players will take to the field at Petco Park for their first practice prior to visits to Rady Children's Hospital and Del Mar beach. 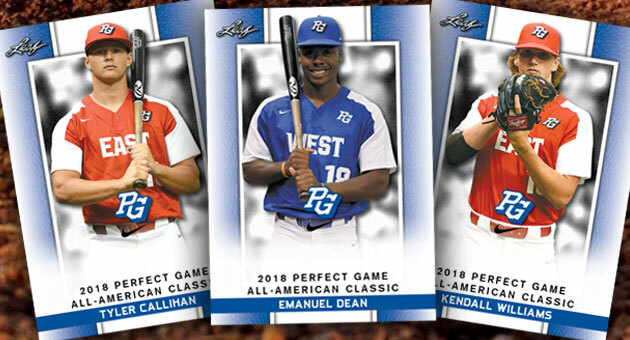 Leaf continues its partnership with Perfect Game to produce incredibly high quality baseball cards for all 52 members of the 2018 Perfect Game All-American Classic. Similar to past years, everyone who attends the Classic at Petco Park will receive three random cards upon entering the ballpark. This year fans can buy a complete set of cards at a table inside the main entrance at Petco Park during the game for $25. Cash and credit cards will be accepted with the proceeds benefitting Rady Children's Hospital. 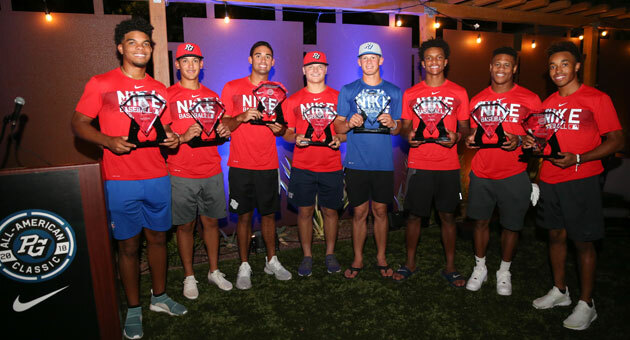 From MLB All-Stars to MVPs, Rookies of the Year and Golden Spikes Award winners, the Perfect Game All-American Classic has produced a steady pipeline of impact talent to the next level. The numbers speak for themselves in this feature: The Classic: By the numbers. The first recipient of the award was Justin Upton in 2004, the second year of the Classic. Kumar Rocker, the starter for the East squad in the 2017 PG All-American Classic, received the honor last year. The full schedule for baseball-related activities for the 2017 Perfect Game All-American Classic can be found here. Included on that page is the schedule for the 2018 PG Underclass All-American Games which will be conducted the two days after the Classic, Monday and Tuesday August 13 and 14. The event will be held at the University of San Diego's Fowler Park and Cunningham Field (Google Maps are also included on that page). This annual event is held in conjunction with the Classic to showcase some of the very best players in future graduating classes. Last year, 17 of this year's All-Americans (Logan Britt, Jaden Brown, Tyler Callihan, Corbin Carroll, Emanuel Dean, Cade Doughty, Hayden Dunhurst, Sanson Faltine III, Garrett Frechette, Damone Hale, Spencer Jones, Jack Leiter, Quinn Priester, Wesley Scott, Logan Tanner, Anthony Volpe, Bobby Witt Jr, ) participated, and almost all of which named to the event's top prospect list. Some of the other All-Americans that attended this event before shining on national TV the following year include two of the game's brightest young sluggers, Kris Bryant and Bryce Harper. 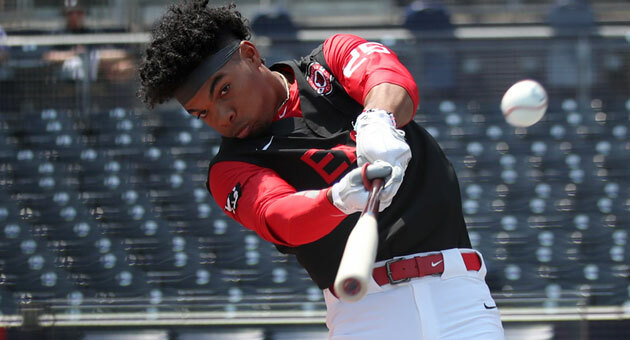 In other words, this year's PG Underclass All-American Games will serve not only as a preview of some of the players we can expect to see in next year's Classic, but also gives us a glimpse at some of the future stars of Major League Baseball. 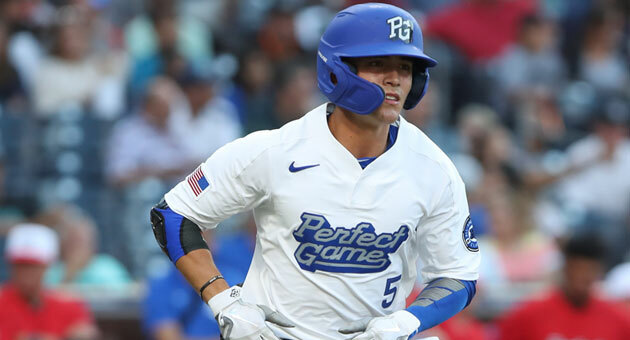 Welcome to the Perfect Game All-American Classic blog, and congratulations to all of the players, friends and family members involved with the Classic. This page will be used to provide updates from all of the events that are part of the four-day festivities. Visit the Roster page to access the individual player profiles, as well as the History page to learn more about the previous 15 games played including the inaugural event in 2003. 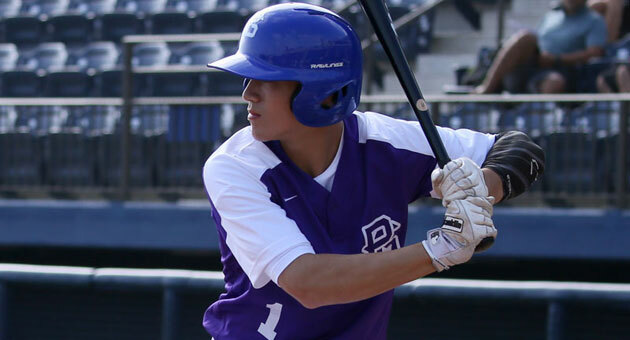 The Scout page provides the daily schedule of baseball-related activities, including those for the 2018 PG Underclass All-American Games. And of course, don't forget to tune into MLB Network, as well as MLB Network Radio, at 5:00 pm PDT on Sunday for the game itself.